A Biblically grounded, six-week plan to lead you on the path toward losing weight and getting healthier by focusing on the connections between spiritual and physical health.So many of the books within the diet and fitness space focus on vanity or superficial reasons for striving for personal health and wellbeing. Is it any wonder then that a motivation that's so surface-level has such a slim chance of working long-term? But Alec Penix believes that all things are possible if you use faith as your bedrock. In Seven Sundays, celebrity trainer and devoted follower of Christ Penix explains the connection between faith and fitness, and both his own and shares his clients' success stories. When our spiritual and physical bodies are built up simultaneously, we find ourselves more likely to stick with healthier, life-changing habits, appreciate what we have, be thankful for what we've gained (and lost), and feel content with how far we've traveled. Seven Sundays is a six-week program that shows you how easy it is to undergo your own total transformation. The book is organized as a day-by-day journey in the same manner as a daily devotional. Over the course of each week, you will work on the "6 Pillars of Purpose" that build up this strength. You will also enjoy "Faith-Full" foods and explore a new spiritual theme each week. Ultimately, you'll undertake a meaningful journey that will finally connect your body and spirit. After Seven Sundays, the changes required to live a healthier life become easier because you will want to do them-for God, for others, and for yourself-rather than ever feel as if you have to do them. It's designed to inspire you to look inside yourself and recognize that it's not that you need to exercise, eat right, and be healthy, but that you deserve to exercise, eat right, and be healthy, and recognize your body as a spiritual vessel. 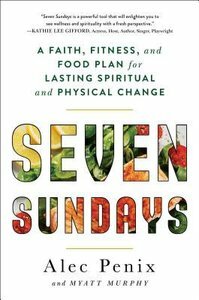 About "Seven Sundays: A Six-Week Plan For Physical and Spiritual Change"
Myatt Murphy has written articles on exercise, lifestyle, nutrition, and sports for more than 40 worldwide magazines, including Esquire, Fitness, GQ, Men s Health, and Sports Illustrated. A frequent guest on CNN News and Good Morning America, he is the author of Men s Health Gym Bible and Men s Health The Body You Want in the Time You Have.